February 25th, 2015 | Bekins Happenings, News and Events. It’s that time of year again! Girl Scouts are pushing their delicious cookie assortment of Thin Mints, Samoas, Tagalongs, Trefoils, Do si Dos and Trios! Before your favorite cookies end up in your hands, did you ever think how the Girl Scouts have their cookies stored and delivered to them? The moving & storage industry helps local Girl Scouts all over the country store and deliver the cookies. For Bekins Van Lines, two agents helped out their local girl scouts by storing and delivering cookies in their area. Brandon Moving & Storage – North Little Rock, Ark. Brandon Moving & Storage stored and delivered girl scout cookies for around 39 troops in the central Arkansas area. They stored approximately 57,000 cases of cookies, which is around 430,000-435,000 lbs.! Brandon Moving & Storage dedicated two office staff members for bookkeeping. The bookkeepers were responsible for counting all of the cases as they were received and documented which ones were damaged. They then entered specific orders into the system from the troops and invoiced the Girl Scouts for payment once all deliveries are complete. In addition to the office staff, 6-8 people in the warehouse were tasked to unload the cookies as they all came in. They had to pull the cookies off in a specific order and load the trucks for delivery. Brandon also had 4-6 truck drivers make deliveries with 1-4 helpers, depending on the size of the orders and whether the cookies have to be unloaded by hand or if the receiving location had a fork lift on site. 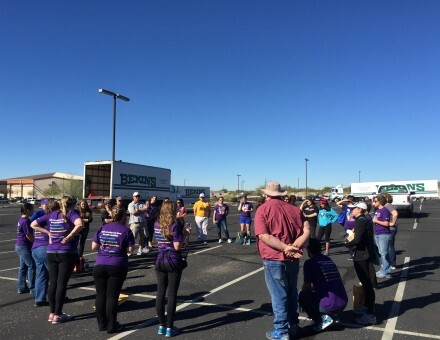 Bekins Moving Solutions, Inc. – Tucson and Phoenix, Ariz.
Bekins Moving Solutions’ two facilities in Tucson and Phoenix, Ariz. covered the cookie deliveries for Girl Scout troops all over the state. All of the cookies were received and stored at both facilities and then loaded for designated distribution locations. At the Phoenix location, they handled approximately 152,000 cases and 1,824,000 boxes shipped throughout central and northern Arizona. Bekins Moving Solutions delivered to 22 out-lying distribution locations and five major locations, which were schools, around the Phoenix metropolitan area. The Tucson facility held approximately 62,000 cases and 744,000 boxes shipped to southern areas of the state. Bekins Moving Solutions then delivered to 20 out-lying area locations and two major areas in Tucson. The largest major distribution location was at the Bekins Moving Solutions Tucson facility. Once the cookies were taken to the designated distribution areas, the individual troops came and picked up the product. Bekins Moving Solutions sent 2-6 crew members to the locations and had around a hundred individual vehicles to load all of the product. The Girl Scouts used numerous volunteers to assist in the distribution at all of the locations. Special thank you to the Girl Scouts of Southern Arizona for pictures of their cookie drop event.